On September 25th 2013 there was a sharp shift in the sailing world. The 34th America’s Cup, being contested in the waters off the San Francisco Bay, had captured a world wide television audience stunned by the story that was unfolding before their very eyes. It was to be one of sport’s greatest ever comebacks, a fairy tale ending to what had been a horrible beginning for Team Oracle USA as they overturned an 8-1 deficit to win 9-8 and retain the trophy. That victory meant many things to many people; it gave Ben the chance to set up his own America’s Cup team in BAR, but it also meant that sailing as a sport had broken through the mainstream barrier. For the first time in a long time it wasn’t news of footballers breaking metatarsals making the back pages but a sailing story, albeit a mighty one, that was dominating the headlines. As a journalist who has covered one too many broken toes and plenty of mainstream sports, I found that fascinating. Sailing had suddenly become interesting and relevant to a lot of people. The news last week confirming the BBC deal to secure the rights to show highlights of the 35th America’s Cup is hugely significant if sailing in this form is to continue to make mainstream inroads. The fact BT have also acquired the exclusive live rights for the UK and Ireland speaks volumes about how seriously broadcasters are taking the Cup. Of course there will be the purists who don’t like the way this is all going, those who would rather see a J Class in the America's Cup rather than an Adrian Newey-inspired foiling multihull but even they will surely appreciate that the current version of the Cup offers a more appealing and commercially viable model for the future of the event. There will always be a place for classic yacht racing, it’s just no longer in the America’s Cup. The last campaign, raced at speeds of over 40knots in AC72’s changed everything. It wasn’t just the narrative. The speed, the power, the skill that was required to squeeze everything possible out of these cutting edge flying machines made an impact too. Every sport needs a pinnacle, something to aim for. 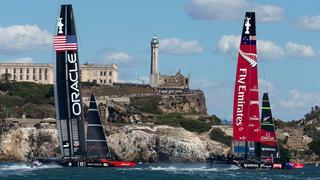 For sailing, it may be the Olympics, the Volvo Ocean Race or indeed the America’s Cup. The more airtime any are afforded, the more a generation has the potential to be inspired. With Ben at the helm of the British bid for the Cup and with the support of the BBC and BT we have a far greater chance of converting excited young viewers into sailors, engineers and designers of the future. When the new foiling AC45F Class takes to the Solent in July for the America’s Cup World Series event, I suspect it will mark a major sea change in the way the public responds to sailing. In the past it has been seen as an elitist niche sport but it has an opportunity to show the wider audience now paying attention just how much it has to offer to all.